Throwing some dirt over the new seedling weeds in your rows isn’t necessarily the end of the story. They could come back, depending on the weed, the tool and the approach you take, according to two weed scientists. Mechanical weed control, using some form of tillage, still has an important role in weed control in Eastern Canada. Generally, though, it isn’t getting much attention from weed science – as compared to research with herbicides. South of Lake Ontario, Charles Mohler, a senior weed research associate at Cornell University in Ithaca, N.Y., recently completed semi-basic ecological research on the ability of five annual weed seedlings to recover from burial. That work has some direct implications for shallow tillage in rows after planting for growers in Ontario and Eastern Canada, says Mike Cowbrough, the field crops weed management specialist with the Ontario Ministry of Agriculture, Food and Rural Affairs, in Guelph, Ont. Most Ontario corn still has some tillage for weed control, although the form can vary, Cowbrough says. “Tillage is very much crop specific. The majority of corn has either a single pass or double pass. The vast majority of wheat acres are no-till, and soybeans probably fall somewhere in the middle for weed control,” he says. As for the weeds, common lamb’s-quarter is the most significant annual weed in Ontario, being both abundant and very competitive. Pigweeds (redroot and green), common ragweed, green, yellow and giant foxtails and velvetleaf also are common annuals. Among perennial weeds, perennial sowthistle is most abundant, he says. “There’s no question that tillage is a critical component of weed management. However, species react in different ways, so the best strategy varies with the weed species,” Cowbrough says. In mid-state New York, with agricultural climate and soils similar to Ontario, Mohler chose to investigate how well five species could recover from burial. The five were common lamb’s-quarters, Powell amaranth (or green pigweed), velvetleaf, giant foxtail and barnyard grass. Greenhouse experiments began in 2006 and ended with field experiments in 2013. Farmers have three basic ways to kill a seedling weed with tillage: burial, dismemberment and uprooting. • Recovery often exceeds 50 per cent if a small portion of a seedling is left exposed. • Recovery from complete burial (by two centimetres of soil) ranges from zero to 24 per cent, but recovery greater than five per cent is rare. • No seedlings recover from four cm of complete burial. • Large-seeded species tend to recover from complete burial better than small-seeded species. • If the soil remains dry after burial, the recovery rate is low or may even be zero. • Small seedlings are easier to kill by burial, with less soil. In a controlled greenhouse setting, weed seedbeds were watered daily at first. After burial, some received no water; some were watered immediately after burial and some had daily watering for up to two weeks. “In one experiment, we got re-emergence of seven seedlings out of thousands that were buried. In another experiment, we watered every day and something like 12 per cent of the velvetleaf re-emerged. Recovery of other species was lower,” Mohler says. Among the five weeds, generally, velvetleaf was the most successful at recovery. The final experiment purposely left a small, consistent fraction of leaf area exposed while burying the rest of the seedling, including the growing point, with two cm of soil. Despite almost complete burial, more than 35 per cent of seedlings recovered in every species. In most cases, more than 50 per cent recovered. Velvetleaf and giant foxtail recovery was 60 to 80 per cent. In practice, Cowbrough says, effective tillage needs strategy as well as complete weed burial. First, there’s a need to distinguish perennial from annual weed control. In-crop tillage is better suited for annual weeds in most cases. Some annuals, such as eastern black nightshade, germinate very late. Those weeds arise too late for effective in-crop tillage. Canada fleabane is a common annual weed in Ontario and often glyphosate-resistant. 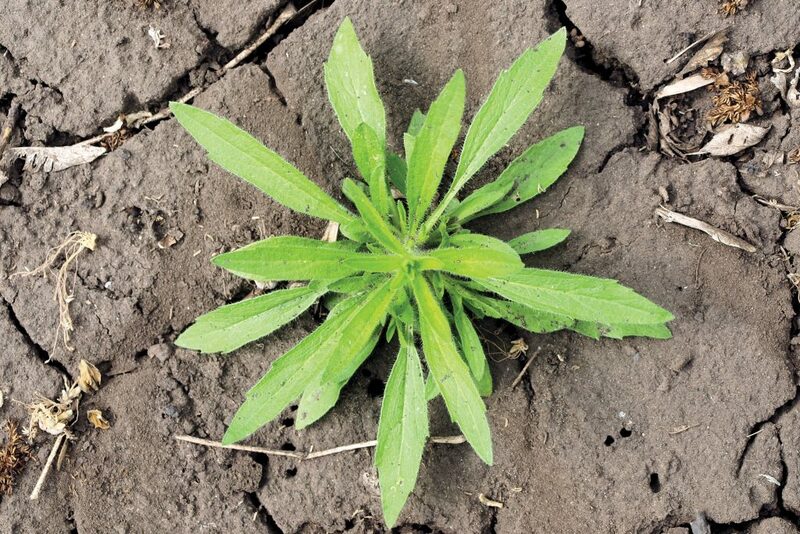 “Tillage is very good at controlling Canada fleabane, if it is aggressive and early. It has to be effective enough to knock the soil off the roots so the fleabane has zero chance of recovery,” Cowbrough says. The second point is about timing. Secondary roots develop as the fleabane gets beyond seedling stage. “Secondary roots hold soil, too. Tillage may uproot the plant but it can eventually recover and grow again as long as it has some secondary roots holding onto soil,” he says. For ragweed control, there are strategy variations. For an infestation of common ragweed, the best strategy is complete burial. “You want to bury the common ragweed seed. The deeper you bury it, the less likely it is to germinate,” he says. But giant ragweed is different, including glyphosate-resistant giant ragweed. However, if conditions were right and last year’s giant ragweed seed got what it needed, it is likely to be up very early and in huge numbers of seedlings ahead of planting. If you go in with a tillage implement to knock down those giant ragweed seedlings ahead of planting, it is just as effective as a chemical burndown. Generally, Cowbrough says, tillage tools can be pretty effective at weed management if they are used appropriately. In the days after a burndown, light disturbance may be enough for burying and controlling weed seedlings that emerge. The disc hiller can bury more advanced weeds ahead of planting. And, after crop emergence, a treatment with the sweeps on a row crop cultivator can throw a lot of soil within the rows to bury and destroy seedling annuals. • Determine the one or two most prominent species to control. • Pick the tillage tool that’s best for that job. No one tool will address all the situations. • If there’s opportunity, adjust the tool to its best advantages.